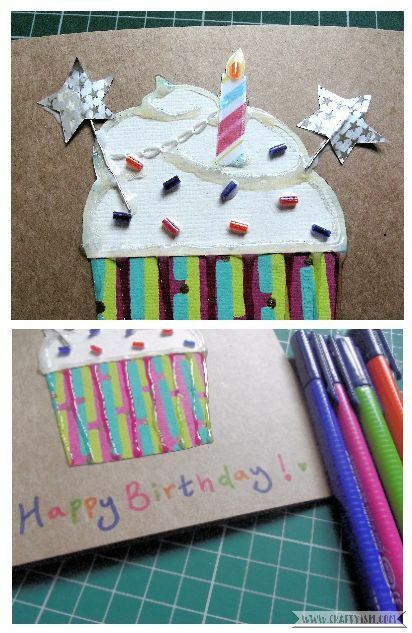 If you need to make a colourful birthday card in a hurry, why not try making this quick and easy Cupcake Birthday Card. Take the paper you chose to be the cupcake icing and on the reverse, draw a fluffy cloud of icing. 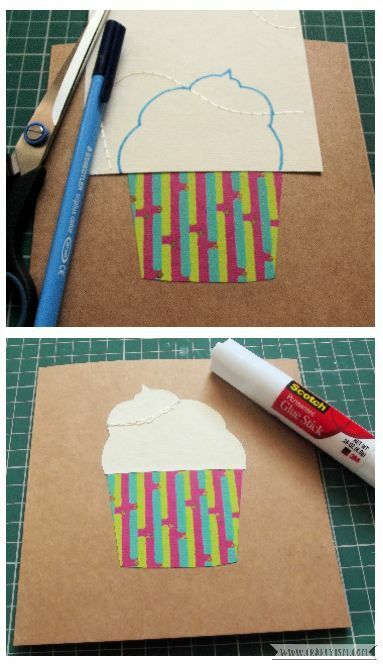 It helps to place the paper on top of the card, so that you can measure how wide it needs to be to fit with the cupcake case. 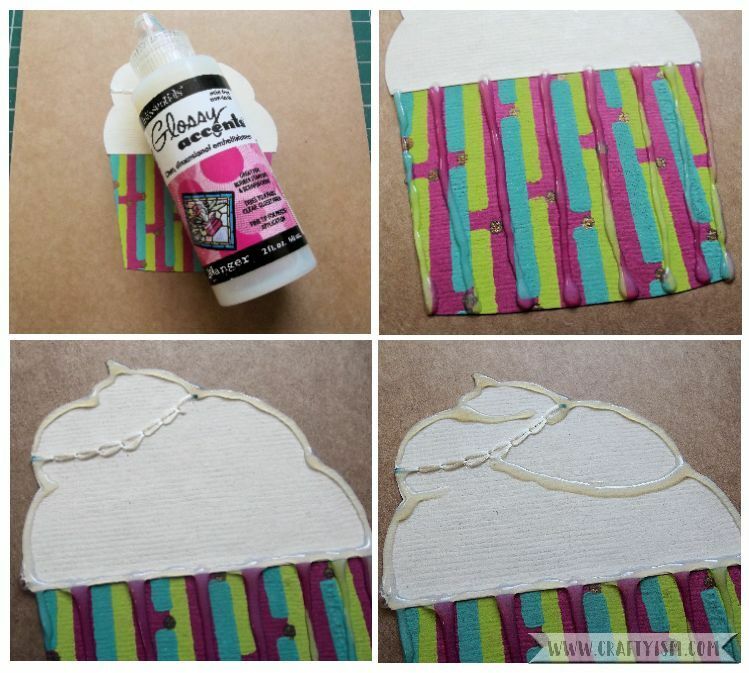 Cut out this shape, then glue it to the top of the cupcake case using the gluestick. Next you will the Inkssentials Clear 3D Glossy Accents glue. This is a product I really love as you can use it as a normal clear glue, or you can use it to embellish any projects where you want a bit of glossy 3D texture. On this card, we will use it to add shape to the cupcake. 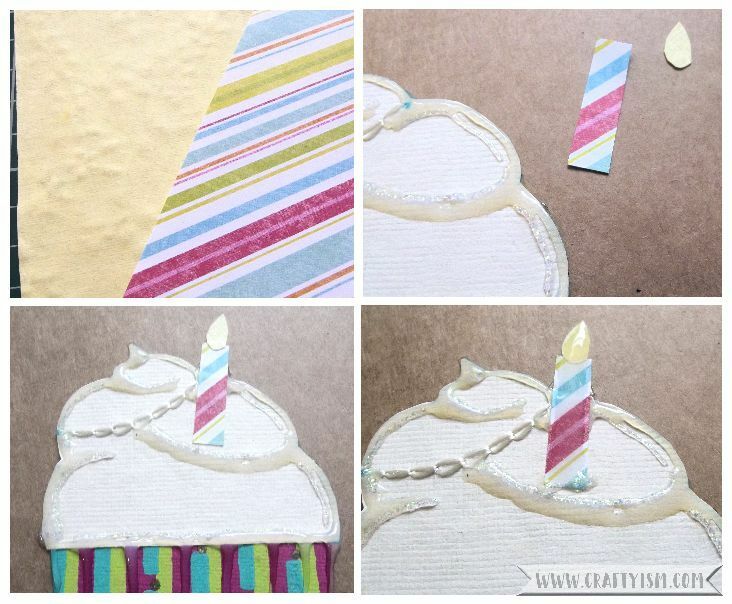 Using it like a regular squeezy glue, make some vertical lines on your cupcake base. These are to mimic the ridges in a normal cupcake case. Then go around the edge of the cupcake icing shape. Lastly, draw some more lines in the cupcake icing to show how fluffy and voluminous it would be if it were real! 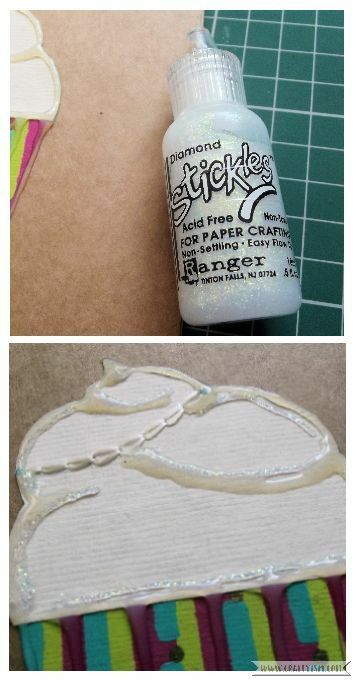 I love the look of glitter on cards, but I really hate touching loose glitter, so Stickles Star Dust Glitter Glue is a hero product for me! Use it along the lines of Glossy Accents Glue to add a bit of sparkle and a some more shine. Going back to your colourful papers, pick a paper to be a candle and another yellow toned paper to be a flame. 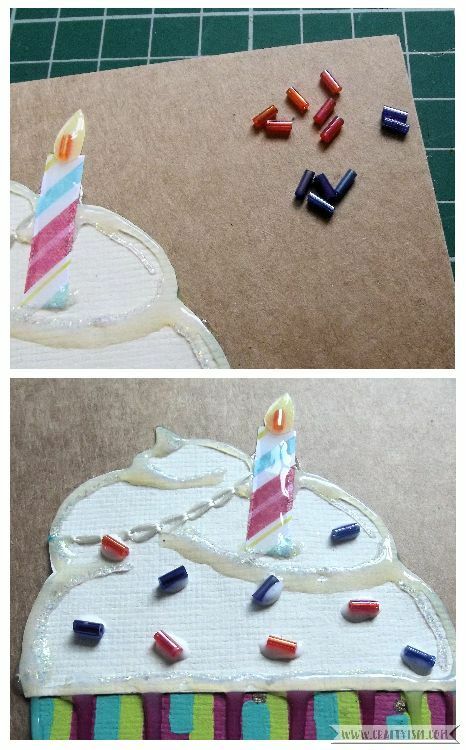 Using the size of the cupcake as a guide, cut an even strip for the candle base and a teardrop shape for the flame. Stick these into the cupcake icing at a jaunty angle, using the gluestick! Grab your Inkssentials Clear 3D Glossy Accents glue again and fill the shape of the candle and the flame. This will make it look like it look more 3D. To add some sprinkles to the cupcake we will be using coloured bugle beads. Stick them onto the icing in a random pattern using the Glossy Accents Glue. Take a yellow or orange bead and stick it onto the flame of the candle to act as a wick. Unbend the metal paperclip, then cut it in half leaving you with two small pieces of wire. 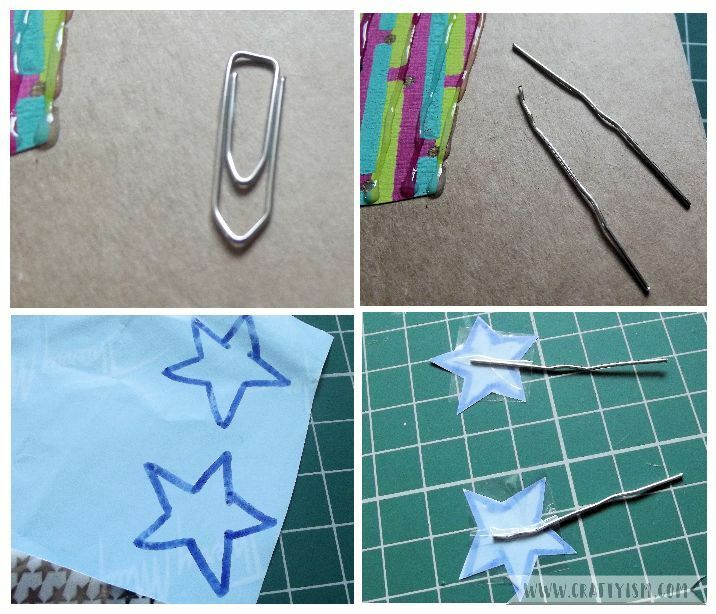 Take some sparkly paper from your pack and draw two star shapes on the back. Cut them out, then stick the wire pieces onto the back using some clear sticky tape. To finish the card, use the Glossy Accents Glue to stick the stars into the icing (you may need to trim the wires slightly). 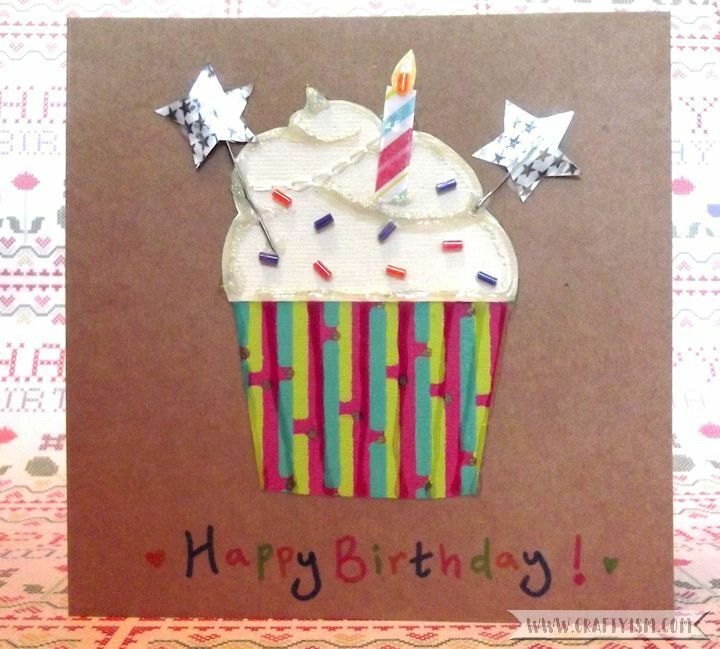 Lastly using felt tips in colours that match your cupcake, write ‘Happy Birthday!’ at the bottom of the card underneath the cupcake. If you don’t like handwriting, you could always use Letraset letter transfers, a stamp and ink or a computer print out. There’s your finished Cupcake Birthday Card! This is such an easy card to customise to your birthday person’s favourite colours and a great way to use up your scraps of patterned papers. Let me know if you have any ideas for quick birthday cards as it’s something I always seem to leave until the last minute!